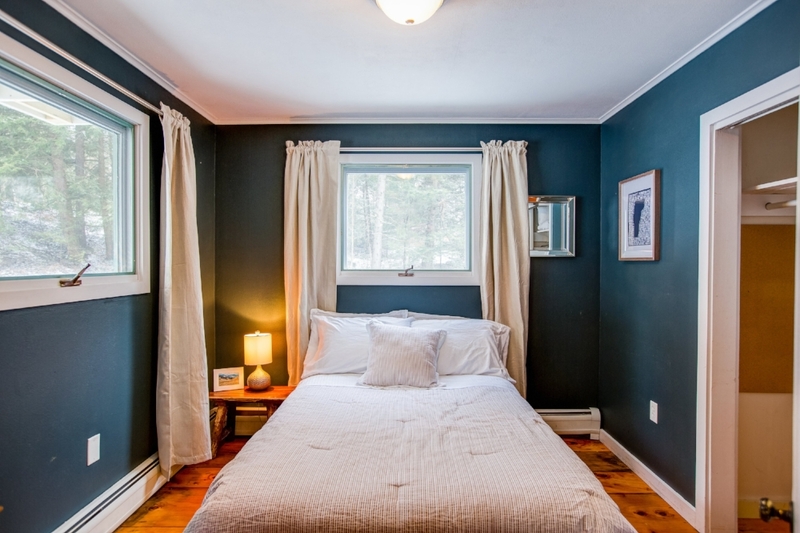 Stay in this charming, private home situated on a quiet dirt road in beautiful Stowe. This home has lots of character with its hand hewn beams and wide plank pine floors. It has 3 bedrooms, 2 baths and sleeps 7. As you enter the home, theres a small mudroom and then it opens to a open kitchen/living/dining room. Next to the kitchen is 1 bedroom with a full sized bed. The living room has a pellet stove and access to the the large deck with picnic table, grill and seating. Walk upstairs and you will discover a full sized bath and the master bedroom with a queen sized bed. This bedroom has access to a private balcony that is on the front of the house. Go downstairs from the main floor and you'll enter a second living space with some sofas, games and small cable tv. There's also a 3/4 bath and a bunk room that sleeps 3. Its a twin over full bunk. Laundry is also there and access to the backyard.